Our good friend, Margaret Rawson Pitney, who grew up in Lake City during Lake City’s railroad era, vividly recalls some of the men who worked on the railroad in her booklet entitled "My Lake City Railroad Memories". Some of her stories are recounted here. "During my time, William R. Pitney (my husband Jim’s father) was the station agent (1905 – 1908). 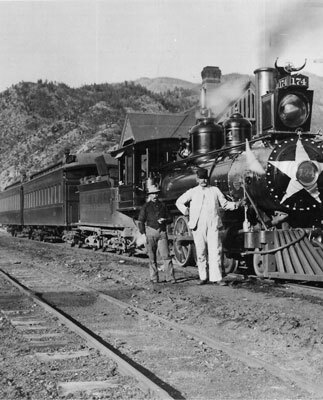 He had come from Leadville where he was the station agent for the D&RG. William and his wife were from Ireland, and when Mrs. Pitney got off the train in Leadville, she said: "William, take me back to Ireland, I’m not going to live in these mountains." "John Lundin replaced William as station agent after he died. John Lundin was a big man, tall and heavy. I remember him especially well because he came every evening for supper (my Mother cooked for additional income), and his favorite meal was trout!" "Johnny Benson was another long-time employee. He moved to the United States from his native Sweden in 1882 and worked as a roundhouse caretaker until 1932. He was quite a gardener, and lived in the Benson-Colopy House at 301 Third Street, which was noted for its fine trees and shrubs. He had a small fishpond and flowering crab trees. (Note: the flowering crab tree is still living). He enjoyed making homemade wine, and was especially known for his dandelion wine. He also made excellent doughnuts. A large box elder tree planted by Johnny still stands majestically in front of the house." "Sap Richardson, the fireman, was always getting "bumped", so he wasn’t here full time, but we could always tell when he was here because he would blow the train whistle all the way into town. I can remember hearing the train whistle all the way over the mountain at Cathedral when I visited my friend Marjorie Stavely." "One of the most well known crewmembers was Peter Joseph "Pete" Ready, the first engineer on the regular train to Lake City. He continued on the branch for 32 years, from 1889 to 1921." 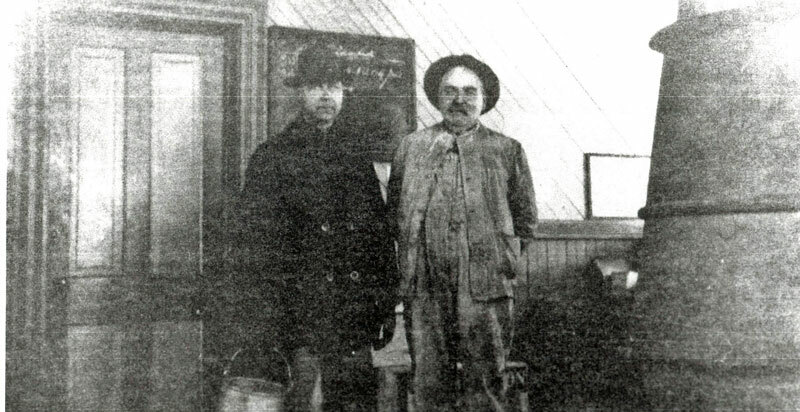 (A rare vintage photo of Pete Ready and possibly Sap Richardson in the train depot – Pete is on the right.) Pete and his wife, Mary Ellen, lived in a house on 3rd Street and Henson. There are a lot of great stories about Pete Ready, one that delighted everyone was the time the train disconnected from the engine and he didn’t know it until he arrived at the Lake City Station. After seeing it missing, he opened the throttle and tore around the loop (Note: Lake City didn’t have a roundhouse, but used a "loop" to turn around) and headed back out Henson Street to find the lost train. In fact, the train had come loose from the tender on a heavy grade just past High Bridge near Stony Gulch. The frightened brakeman had tightened the hand brake immediately and in a matter of minutes he saw Ready tearing back down the tracks. The coupling was made without incident and the train headed back up to Lake City." According to Clarence Wright, "This incident cost Pete, who was a very good fellow, a good many laughs and some cigars." "Pete had witnessed many events during his time in Lake City, including one time when a minister requested an unofficial train stop in the Lake Fork Canyon for him to perform a marriage of a young couple who had asked to be married in the Lake Fork Canyon. As always, Pete obliged the minister, and the train crew acted as witnesses to the bride and groom’s wedding." (Silver Rails, Masters Thesis, by David B. Flynt). It wasn’t an easy task for the train crew to make the run to Sapinero every day given all the severe weather conditions and dangerous gulches and canyons to be crossed. These men were truly brave pioneers who made up a part of the Country’s "westward expansion".